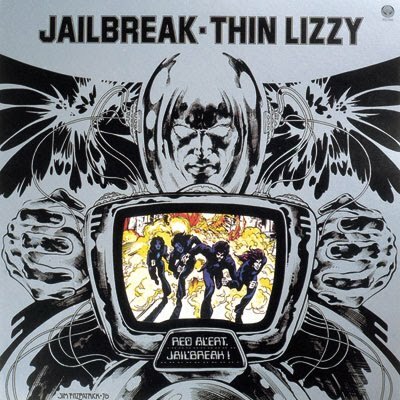 A relatively odd mixture of foundation metal and trippy pop, the material on Jailbreak ranges from the classic to the forgettable, but the good outweighs the bad and the overall impact is powerful. The title track Jailbreak along with The Boys Are Back In Town remain popular and instantly recognizable more than three decades after their creation. Indelibly linked to Thin Lizzy, these two tracks combine inspired songwriting, accessible melodies and an uncompromising metal edge to achieve universal and long lasting appeal. Almost as good is the closing track Emerald, which ends with two minutes of the best unleashed metal guitar work from the 1970's, Scott Gorham and Brian Robertson establishing themselves among the earliest and most dangerous tandem guitar threats. Warriors and Cowboy Song add good depth and variety to the album, both featuring mature songwriting, emotive singing from Phil Lynott and catchy guitar solos. Some of the good vibes are undone by the weaker more poppy and dreamy tracks like the lazy Running Back and uninspired Fight Or Fall. Compared to the early giants of the metal genre, Thin Lizzy were on the relative margin of great success and recognition, but with Jailbreak, they left a permanent signature on the decade of metal's formation.